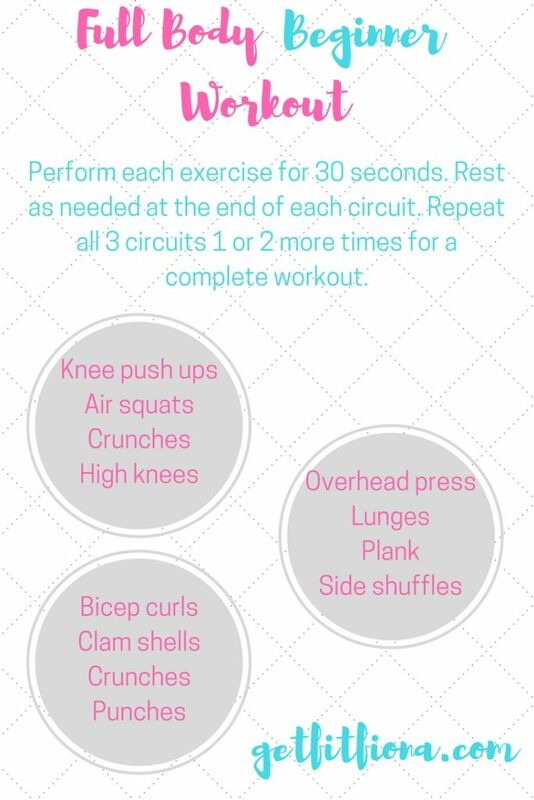 Today’s workout is perfect for those who are new to fitness and are looking for a beginner friendly workout. This full body beginner workout combines both upper and lower body strength training moves, a core exercise, and ends with a cardio move at the end of each circuit. Once you’ve completed each circuit, rest as long as you need before moving onto the next one. Repeat all three circuits once or twice more for a complete workout. Below the graphic I’ve listed descriptions of each exercise. The only equipment you’ll need for this workouts is a yoga mat for the knee push ups, crunches, plank, and clam shells. I like these Manduka ones (affiliate link). I also like these dumbbells (affiliate link) for the overhead press and bicep curls. You’ll notice that I didn’t include any weights for the exercises that use dumbbells. Everyone will need a different weight. Use a weight that makes the last 1 or 2 reps hard, but that you can still do with good form. If your form deteriorates, use a lighter dumbbell. If you feel like you can do even more reps by the time the 30 seconds are over, try a heavier dumbbell. If you’re looking for more workouts, be sure to check out my workouts page. I have everything from strength training to cardio workouts there – even more beginner ones. I think you’ll be able to find something you’ll like. Starting on your knees and hands, make sure your body is a straight line from your knees to hips, shoulders, and neck. Your hands should be a bit wider than your shoulders. Slowly bend at the elbows, lowering yourself to the ground. Try to get at low as possible, and then push yourself back up, all the while maintaining that straight line. Stand with feet hip width apart. Step forward with one foot so that the forward leg’s thigh is parallel to the ground, and the back leg’s shin is parallel to the ground. The back knee shouldn’t touch the floor. Use your quads and glutes to step the front foot back towards your back foot and end by standing straight up with feet hip width apart again. For the second lunge step forward with the other foot. Continue alternating legs. As always, remember to check with your doctor if you’re new to exercise. Honor your body and modify this workout for your body. This post contains affiliate links. Thank you for supporting my blog, I appreciate it.